发表文章：Ethyl pyruvate attenuates murine allergic rhinitis partly by decreasing high mobility group box 1 release, Experimental Biology and Medicine, 2015. 评语：欣博盛ELISA试剂盒重复性好, 板间差异小。而且设定了最优的检测范围, 检测灵敏度高, 生产团队专业, 质量有保障! 文章：Enzyme responsive mesoporous silica nanoparticles for targeted tumor therapy in vitro and in vivo, Nanoscale, 2015. 文章：The effect of chronic stress onanti-angiogenesis of sunitinib in colorectalcancer models, Psychoneuroendocrinology, 2015. 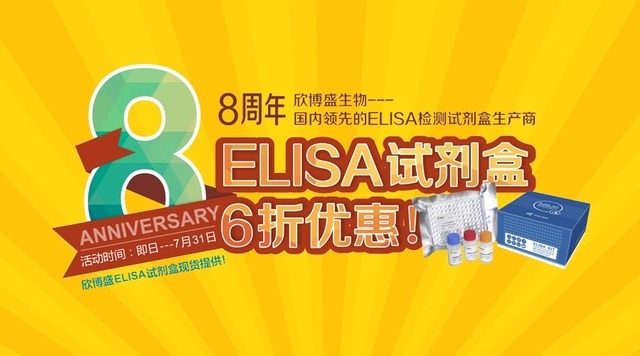 文章：Structure Characterization of a Novel Polysaccharide from Dictyophora indusiata and Its Macrophage Immunomodulatory Activities, Journal of agricultural and food chemistry, 2014. 文章：Morphological and Proteomic Analyses Reveal that Unsaturated Guluronate Oligosaccharide Modulates Multiple Functional Pathways in Murine Macrophage RAW264. 7 Cells, Marine drugs, 2015. 文章题目：Preventing bacterial DNA release and absent in melanoma 2 inflammasome activation by a Legionella effector functioning in membrane trafficking .